The observation of the sky was of considerable importance to the Maya, Aztecs and other prehisanic peoles of Mesoamerica. The observation of the sky was of considerable importance to the Maya, Aztecs and other prehispanic peoles of Mesoamerica. Their familiarity with the regularities of the apparent motion of the Sun, the Moon and bright planets is attested in a large amount of astronomical data contained in codices and monumental hieroglyphic inscriptions. The study of architectural alignments has also disclosed that civic and ceremonial buildings were largely oriented on astronomical grounds, mostly to sunrises and sunsets on certain dates, allowing the use of observational calendars that facilitated a proper scheduling of agricultural and the associated ritual activities in the yearly cycle. Both accurate knowledge and other astronomically-derived concepts reveal that the significance attributed to certain celestial events by the ancient Mesoamericans can be explained largely in terms of the relationship of these phenomena with specific environmental and cultural facts, such as seasonal climatic changes and subsistence strategies. It was particularly due to its practical utility that astronomy, intertwined with religious ideas and practices, had such an important lace in the worldview and, consequently, in the cosmologically substantiated political ideology of Mesoamerican societies. Mesoamerica is a culturally defined geographical area corresponding to central and southern arts of modern Mexico and the northern art of Central America. The term refers to the territory on which civilizations, with common cultural traits, flourished since the 2nd millennium B.C., when the first complex societies emerged, until the Spanish conquest in the early 16th century A.D. The history of Mesoamerica is traditionally divided into three main periods or evolutionary stages: the preclassic (ca. 2000 B.C. – A.D. 250), Classic (250 – 900) and postclassic (900 – 1519). The earliest urban societies appeared during the preclassic along the southern art of the Mexican Gulf Coast, in central Mexico and in the Maya area in the Mesoamerican southeast. The greatest splendor, particularly notable in fine arts, architectural achievements and writing systems, was reached during the Classic, whereas the postclassic period was characterized by intensified migrations, pronounced militarization and, particularly in the Maya area, by increased political fragmentation. The antiquity of astronomy and its importance in all ancient civilizations (cf. Waerden 1974) can be accounted for by its practical uses. Celestial motions allow orientation in both time and space. Seasonal changes in natural environment coincide with various cyclical events observable in the sky. However, since the periodicity of the latter is much more stable and exact, the observation of these regularities allowed ancient societies to predict annual changes in their environments and to regulate their activities in time. The need for astronomical observations increased notably with the origin of agriculture as farming requires an orderly scheduling of labors in the yearly cycle such as planting and harvesting. Since astronomical knowledge offered adaptive advantages to the societies possessing better specialists in this field, it acquired great importance in early states, contributing to the legitimation of power of the ruling class (cf. Reyman 1975; Broda 1982; Aveni & Hartung 1986, . 56; Iwaniszewski 1989, . 28f; Šrajc 1996, . 20ff). Astronomical observations resulted, on the one hand, in a corpus of exact and practically useful knowledge. On the other hand, the celestial order, apparently invariable and perfect, came to be considered superior to the terrestrial and human order, and this notion gave rise to an enormous variety of myths and beliefs which explained why and how events on Earth depended on celestial phenomena observed in the heavens. In any articular social group, the exact concepts and those defined in terms of our current knowledge as “non-scientific” are normally intertwined and integrated in a relatively coherent worldview, which can be properly understood only if examined as a whole and in the light of the specific natural, social and historical context; both correct and false ideas can shed considerable light on the society being studied. This holistic aroach has been adopted by archaeoastronomy, a relatively new anthropological discipline focused not only on exact knowledge but rather on all astronomically derived concepts and related cultural manifestations. Taking into account specific environmental peculiarities, subsistence strategies, sociopolitical structure and historical antecedents of the society under study, archaeoastronomy searches for answers to a number of questions: Why did certain astronomical phenomena acquire a prevailing importance? What were the social functions of astronomical knowledge? Which were the observational bases of the concepts embedded in myths, iconograhy, attributes of gods, etc.? 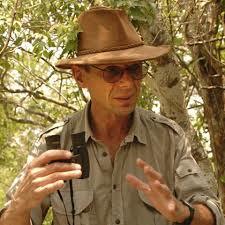 In its attempts to solve problems of this kind, archaeoastronomy participates in common efforts of anthropological disciplines and contributes to a more comprehensive understanding of ancient societies, as well as of general processes of cultural evolution (Aveni 1989; 2001; 2003; Broda 1982; 1992; Iwaniszewski 1989; 1994; Ruggles 1999; Šrajc 2005). Mesoamerican archaeoastronomy relies on a variety of sources. Astronomical concepts and practices are referred to in the iconography and hieroglyphic texts in prehisanic manuscripts or codices, monumental inscriptions, mural paintings, reliefs and other archaeological objects. Complementary information is contained in early colonial documents and, considering that fragments of prehisanic cultural heritage survive in modern indigenous communities, even in the ethnographic material. Furthermore, relevant data on prehisanic astronomy are embedded in spatial distribution of archaeological vestiges, particularly in architectural orientations and other alignments detected in ancient cultural landscapes. 3a: Calendrical System: Like any other precise calendar invented in the history of humankind, the complex Mesoamerican calendrical system was based on astronomy (Aveni 2001; Caso 1967; Kelley 1976; Lounsbury 1978; Thomson 1950). The relation between the troical year and the 365-day Mesoamerican year, composed of 18 months of 20 days and an additional 5-day period, is evident. While the origin of the other an- Mesoamerican calendrical cycle, which had 260 days, is less clear, it has been noticed that the length of two 260-day periods corresonds, with reasonable accuracy, to three eclipse half-years of 173.31 days, and that the synodic period of Mars (779.94 days) equals almost exactly three 260-day cycles. It has also been suggested that the 260-day count was invented somewhere along the 15th parallel north, because at this latitude the Sun’s passages through the zenith are separated by intervals of 105 and 260 days (Aveni 2001, . 184ff; Malmström 1997, . 47ff; Šrajc 2001a, . 279f). Whatever its origin, this cycle, unique in the history of humankind, had an enormous importance in all calendrical and astronomical computations. 3b. The Sun and the Moon: The 365-day calendrical year was likely derived from the observation of the Sun’s annual movement along the horizon. This is suggested by the importance of solstitial extremes, attested since early periods and reflected not only in architectural orientations (see below) but also in the concept, apparently an- Mesoamerican, that the sky corners are located at the four solstitial points on the horizon (cf. Milbrath 1999, . 19; Šrajc 2001a, . 281). The zenith passages of the Sun were also observed, and of articular importance the first annual transit; though its exact date depends on the latitude, this event occurs throughout Mesoamerica in late April or May and thus announces, or coincides with, the onset of the rainy season, a crucial moment in the agricultural cycle (Aveni 2001, . 40ff; Tedlock 1992; Šrajc 2001a, . 281ff). A wide variety of sources demonstrate the importance of the Moon in Mesoamerica (Milbrath 1999; Thomson 1939; Galindo 1994). Chronological information in Maya hieroglyphic inscriptions regularly includes the data on the “age” of the Moon expressed in the so-called Lunar Series. To keep their lunar months of 29 or 30 days in step with lunations of 29.53059 days during longer periods, the Maya alternated them using different formulae. This enabled them to achieve a remarkable degree of precision reflected in lunar data calculated for dates in distant ast and future (Lounsbury 1978; Aveni 2001, . 155ff; Cases et al. 2004; Fuls 2007). In all ancient traditions the eclipses were considered as bad auguries. This is because they are relatively rare and difficult to predict and, therefore, are associated with bringing disorder and disrupting the cosmic harmony. Various prehisanic codices and early colonial sources contain information on native beliefs about eclipses and on ritual performances intended to prevent their negative influences (Caso 1967, . 93ff; Aveni 2001, . 26ff; Galindo 1994, . 70ff). On the other hand, the Mesoamerican astronomers-priests achieved a rather sophisticated knowledge about the periodicity of eclipses. The most explicit information can be found in the Dresden Codex, one of the few Maya manuscripts that survived to our time: the dates listed on the ages constituting the so-called Lunar Table are spaced at typical eclipse intervals (177 and 148 days). The purpose of such tables was astrological: if the possibility or “danger” of an eclipse could be predicted, the appropriate ritual acts could be performed on time (Thomson 1972; Lounsbury 1978; Aveni 2001, . 173ff; Bricker & Bricker 1983; Justeson 1989; Martin 1993; Knowlton 2003). Figure 1. Fifth age of the Dresden Codex Venus Table. The bar and dot numerals in the bottom line (each bar represents five, a dot is equivalent to one, and the shell symbol stands for zero), compose numbers written in the Maya vigesimal positional notation (11.16; 4.10; 12.10; 0.8), which correspond to the canonical periods of morning star visibility (236 days), invisibility around superior conjunction (250 days), evening star visibility (250 days) and disappearance around inferior conjunction (8 days) in one synodic period of 584 days. The intervals separate the first and last appearances of the morning and evening star, falling on the dates of the 260- day and 365-day cycles listed in the upper rows. The accompanying text and images refer to the deities residing over this synodic cycle, and to the victims of the baleful first appearances of the morning star. 3c. Planets and Stars. Among the planets observed in Mesoamerica, Venus had a paramount importance. The finest example of the knowledge on this lanet is the Venus Table in the Dresden Codex. The five ages of the table, each of them covering one synodic period, reflect the commensurability of five synodic periods and eight calendrical years. The complete run of the table embraces 37,960 days or 104 years, which is the lowest common multiple of the canonical Venus period of 584 days and of the 260-day count (37,960 = 65 x 584 = 146 x 260 = 104 x 365; Fig. 1). It is notable that even if the difference between the true mean length of Venus synodic revolution (583.92 days) and the canonical value assigned to this period by the Mesoamericans (584 days) resulted in an error of 5.2 days, accumulated after the complete run of the table, an introductory age reveals that the table was “recyclable.” In fact, occasionally, correction mechanisms were applied, intended to maintain the dates of Venus phenomena predicted by the table (first and last appearances of the morning and evening star) in accordance with observational reality (Lounsbury 1978; 1983; Aveni 1992; 2001, . 184ff; Šrajc 1996, . 50ff). While Venus as morning star at its first appearance after inferior conjunction was believed to inflict harm on nature and humankind (Thomson 1972, . 67ff; Aveni 2001, . 195f), the evening star had a prevalent role in the beliefs about rain, maize and fertility. The main observational motive of the latter concepts must have been the seasonality of the lanet’s maximum and minimum declinations observable as extreme rising and setting points: the evening star extremes, constantly occurring in April-May and October-November, coincide with the beginning and the end of the rainy season and, therefore, also delimit the agricultural cycle in Mesoamerica. Venus also figured prominently in ideas and ritual practices linked to warfare and sacrifice, and was also believed to be an eclipse agent (Carlson 1991; Closs 1994; Closs et al. 1984; Milbrath 1999; Šrajc 1993a,b; 1996). While other planets seem to have had much less importance, one section of the Dresden Codex has been interpreted as a Mars Table, and references to Jupiter and Saturn have been found in some Maya texts (Aveni 2001, . 196ff; Aveni, Bricker & Bricker 2003; Aveni & Hotaling 1994; Bricker & Bricker 1986; Fox & Justeson 1978; Love 1995; Lounsbury 1989). A number of prehisanic constellations or asterisms have been identified (Aveni 2001, . 29ff; Galindo 1994, . 90ff; Köhler 1991; Luo 1991; Tedlock 1992; Justeson 1989; Milbrath 1999). A table in the Maya manuscript known as aris Codex, containing dates accompanied by different animals hanging from celestial bands, has been interpreted by various researchers as a Maya zodiac (Fig. 2). However, there is no general agreement about the functioning of the table and the identity of the constellations represented (Kelley 1976, . 45ff; Aveni 2001, . 200ff; Justeson 1989; Bricker & Bricker 1992; Love 1994, . 93ff). Figure 2. Zodiacal almanac in the Paris Codex. 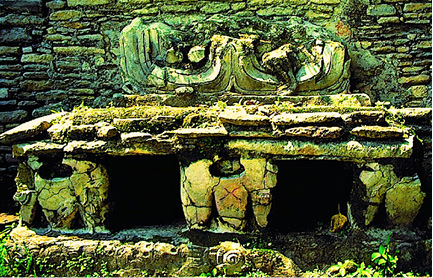 Systematic research carried out during the last few decades has revealed that Mesoamerican architectural orientations exhibit a clearly non-uniform distribution and that civic and ceremonial buildings were largely oriented on the basis of astronomical considerations, particularly to the Sun’s positions on the horizon on certain dates (Aveni 2001; 2003; Aveni & Hartung 1986; 2000; Galindo 1994; Tichy 1991; Šrajc 2001b). The earliest orientations in Mesoamerica refer to solstitial sunrises and sunsets, probably because the solstices, marked by easily perceptible extremes of the Sun’s movement along the horizon, must have been the most elementary references for orientation in time (Fig. 3). Two other rather easily determinable dates are the so-called quarter-days of the year, or mid-points in time between the solstices (March 23 and September 21, ± 1 day). 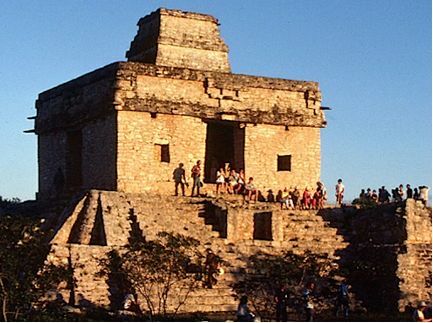 While there is no compelling evidence that the true equinoxes were known in Mesoamerica, the orientation of architecture to sunsets on the quarter-days of the year are quite common (Aveni 2001, . 245ff; Aveni, Dowd & Vining 2003; Aveni & Hartung 1986; 2000; Tichy 1991; Šrajc 1995; 2001b; 2008). The solstitial and quarter-day orientations are not limited to the early periods of Mesoamerica; in later times, however, more complicated orientation principles began to prevail. Figure 3. 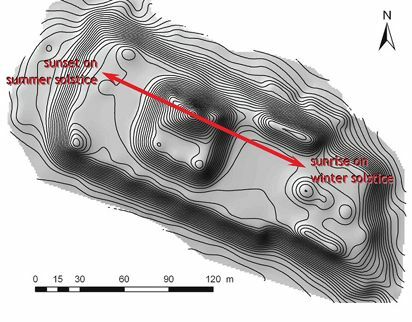 Group F of Yaxnohcah, a large Maya urban center discovered in 2004 in southeastern Campeche, Mexico, exhibits a solstitial orientation (digital relief model by Tomaž odobnikar). As the surface ceramics indicates, this huge acropolis was built as early as midfirst millennium B.C. (Middle preclassic period; Šrajc 2008: 236f). Recent studies based on a number of archaeological sites with monumental architecture in central Mexico and in the Maya area have revealed that the alignments enabled the use of observational calendars composed of calendrically significant and, therefore, easily manageable intervals. The intervals separating the sunrise and sunset dates recorded by orientations at a articular site tend to be multiples of 13 or 20 days, i.e. basic periods of the Mesoamerican calendrical system. The correspondence between the most frequently recorded dates and the crucial moments of the cultivation cycle suggests that the observational schemes, reconstructed for a number of sites, served for predicting important seasonal changes and for accurately scheduling corresponding agricultural and ritual activities (Aveni & Hartung 1986; Aveni, Dowd & Vining 2003; Šrajc 2001b; 2008; Šrajc et al. 2009). It should be recalled that the Mesoamerican calendrical year of 365 days, due to the lack of intercalations, did not maintain a perpetual concordance with the tropical year of 365.2422 days; direct astronomical observations were, therefore, always necessary. The orientations of public buildings, marking critical and canonized moments of the year of the seasons, not only allowed their determination by means of direct observations: since the observational schemes were composed of elementary periods of the formal calendrical system, it was relatively easy to anticipate the relevant dates (this was important because cloudy weather could impede direct observations on these dates). Knowing the structure of a articular observational calendar and the mechanics of the formal one was of crucial importance to these societies. Particularly important for these purposes must have been the 260-day calendrical count, in which the cycles of 13 and 20 days were intermeshing: every date had a name composed of a number from 1 to 13 and a sign in the series of 20. Given the structure of this calendrical count, the sunrises and sunsets, separated by 13-day intervals and their multiples occurred on the dates with the same numeral, while the events separated by periods of 20 days and their multiples fell on the dates having the same sign (Fig. 4; Šrajc 2001b). In some cases, the relevant dates were marked by attractive light-and-shadow effects produced by appropriate spatial arrangement of certain architectural elements including stairways (Fig. 5; Anderson et al. 1981; Aveni 2001, . 265ff, 295ff; Aveni et al. 2004; Carlson 1999; Galindo 1994; Šrajc 1995). Figure 4. Along the east-west axis of the central and uppermost art of the Acropolis at Xochicalco, Morelos, Mexico, the sun rises on February 12 and October 30 (Left) and sets on April 30 and August 13 (Right). The four dates, recorded by a number of orientations in Mesoamerican architecture, must have been canonical dates of a ceremonial agricultural cycle: on the one hand, they delimit intervals of 260 days (from February 12 to October 30, and from August 13 to April 30), equivalent to the length of the Mesoamerican ritual calendrical count; on the other, these dates approximately coincide with four critical moments in the maize cultivation cycle, i.e. the preparation of fields (February), the onset of the rainy season and the time of planting (around May 1st), the appearance of the first corn cobs or pelotes (August), and the end of the rainy season and the beginning of harvest (around November 1st). While the orientations in Mesoamerican architecture are predominantly solar, a few alignments to Venus extremes have also been identified. The referred targets were the evening star extremes, robably because they approximately delimit the rainy season (see above) (Aveni et al. 1975; Šrajc 1993a; 1996). A few architectural alignments might also refer to major lunar standstills (Aveni & Hartung 1978; Šrajc 2009) and, possibly, to the rising or setting points of some brilliant stars (Aveni 2001, . 262ff). Figure 5. At Dzibilchaltún, Yucatán, Mexico, an interesting light-and-shadow effect can be observed twice a year in the Classic Period Temple of the Seven Dolls. In late afternoons, when the Sun rays enter the building through two windows and two smaller openings in the western wall (To), illuminated rectangles are projected on the opposite inner wall, moving u as the Sun descends, and disappearing at the moment of sunset; on the quarter days of the year (March 23 and September 20), they disappear aligned exactly with the corresponding openings in the eastern wall (bottom Right and Left). In Mesoamerica, just like in other ancient civilizations whose subsistence was based on intensive agriculture, the ability to predict important seasonal changes in natural environment was of paramount importance. In the absence of a calendar accurately reproducing seasonal cycles, reliable predictions could only be based on astronomical observations performed by specialists familiar with cyclical celestial phenomena and their concomitance with annual climatic variations. This was a lot of power to be ut in the hands of a few. Considering that an efficient distribution of activities in the agricultural cycle increased productivity and secured survival to a larger population, the astronomers-priests’ professional skills were vital for a successful economy and a smooth functioning of the existing social and political system. Figure 6. A throne in a monumental building at Toniná, a large Maya site in Chiapas, Mexico, is decorated with a giant Venus glyph elaborated in stucco. In view of the parallelism observed between the movement of celestial bodies and the alternation of seasonal changes in natural environment, and because the intervals at which astronomical phenomena recur are much more constant and precise than those separating other cyclical events in nature, the sky was considered, since time immemorial, to be the image of divine perfection and supreme order to which human and earthly order was subordinated. With the origin and development of social stratification, such beliefs were modified and incorporated into the ideology that was elaborated, declared and imposed by the ruling elite, with the purpose of sanctioning and maintaining the existent social order. The rulers were believed to be men-gods responsible for performing ritual activities that guaranteed a proper development of natural cycles and the reservation of the ideal cosmic order (cf. Lóez Austin 1973). Advances in astronomical knowledge made the achievement of these objectives more effective, as they allowed the most approriate moments for every ceremonial act to be determined with greater precision. Moreover, reliable predictions of celestial events and the corresponding astrological auguries contributed to the legitimation of power, justifying the privileges enjoyed by the rulers and their collaborators dedicated to the priesthood, astronomy and the calendar (Aveni 1989; 2001; 2003; Broda 1982; 1992; Šrajc 1996; 2005). The apparently immutable and perfect order observed in the sky, obviously superior to the one reigning on the earth, must have been the primary source of deification of heavenly bodies. Therefore, the cyclic behavior of the stars and planets was not viewed as being simply correlated with seasonal transformations in natural environment, but rather as provoking them. It comes as no surprise, then, that the rulers personifying important deities were also associated with the latter’s celestial avatars, particularly the Sun and Venus (Fig. 6). On the other hand, due to the belief that the proper movement of the Sun, Venus and other celestial bodies were responsible for timely occurrences of cyclical natural changes, the directions to the points of their rising and setting on crucial dates of the yearly cycle also acquired a sacred dimension. Consequently, the alignments reproducing significant astronomical directions in civic and ceremonial architecture can be interpreted not only as a sanctified materialization of the union of space and time, whose importance in the Mesoamerican world view is attested in different sources, but also as a manifestation of the attempts of the governing class to legitimate its power by recreating and perpetuating the cosmic order in the earthly environment. Hence the alignments in Mesoamerican architecture, just like other types of evidence, clearly show that practical use of astronomy was intimately related to social organization, religion and political ideology of prehisanic societies. Anderson, N. S., Morales, M., Morales, A. (1981). A solar alignment of the palace tower at palenque. Archaeoastronomy: The Bulletin of the Center for Archaeoastronomy 4 (3), 34-36. Aveni, A. F. (1989). Introduction: whither archaeoastronomy? In: Aveni, A. F. (Ed. ), World Archaeoastronomy, Cambridge University ress, Cambridge, . 3-12. Aveni, A. F. (1992). The Moon and the Venus Table: an example of commensuration in the Maya calendar. In: Aveni, A. F. (Ed. ), The Sky in Mayan Literature, Oxford University Press, New York – Oxford, . 87-101. Aveni, A. F. (2001). Skywatchers: A Revised and Updated Version of Skywatchers of Ancient Mexico. University of Texas Press, Austin. Aveni, A. F. 2003. Archaeoastronomy in the ancient Americas. J. Archaeol. Res. 11: 149-191. Aveni, A. F., Hartung, H. (1978). Los observatorios astronómicos en Chichén Itzá, Mayaán y aalmul. Boletín de la Escuela de Ciencias Antroológicas de la Universidad de Yucatán 6, núm. 32, 2-13. Aveni, A., Hartung, H. (1986). Maya City planning and the Calendar. Transactions of the American Philosohical Society, v. 76, art 7, Philadelphia. Aveni, A., Hartung, H. (2000). Water, mountain, sky: the evolution of site orientations in southeastern Mesoamerica. In: Quiñones Keber, E. (Ed. ), In chalchihuitl in quetzalli: Mesoamerican studies in honor of Doris Heyden, Labyrinthos, Lancaster, . 55-65. Aveni, A. F., Hotaling, L. D. (1994). Monumental inscritions and the observational basis of Maya Planetary astronomy. Archaeoastronomy 19 (sul. to J. Hist. Astron. 25), S21-S54. Aveni, A. F., Bricker, H. M., Bricker, V. R. (2003). Seeking the sidereal: observable planetary stations and the ancient Maya record. J. Hist. Astron. 34, 145-161. Aveni, A. F., Dowd, A. S., Vining, B. (2003). Maya calendar reform? Evidence from orientations of specialized architectural assemblages. Lat. Am. Antiq. 14, 159-178. Aveni, A. F., Gibbs, S. L., Hartung, H. (1975). The Caracol tower at Chichen Itza: an ancient astronomical observatory? Science 188, 977-985. Aveni, A. F., Milbrath, S., Peraza Loe, C. (2004). Chichen Itza’s legacy in the astronomically oriented architecture of Mayapan. Res: Anthropology and Aesthetics 45, 123-143. Bricker, H. M., Bricker, V. R. (1983). Classic Maya Prediction of solar eclipses. Curr. Anthrool. 24, 1- 23. Bricker, H. M., Bricker, V. R. (1992). Zodiacal references in the Maya codices. In: Aveni, A. F. (Ed. ), The Sky in Mayan Literature, Oxford University Press, New York – Oxford, . 148-183. Bricker, V. R., Bricker, H. M. (1986). The Mars Table in the Dresden Codex. In: Andrews V, E. Wyllys (Ed. ), Research and Reflections in Archaeology and History: Essays in Honor of Doris Stone, Tulane University, New Orleans, . 51-80. Broda, J. (1982). Astronomy, cosmovisión, and ideology in Pre-Hisanic Mesoamerica. In: Aveni, A. F., Urton, G. (Eds. ), Ethnoastronomy and Archaeoastronomy in the American Tropics, Annals of the New York Academy of Sciences, v. 385, . 81-110. Broda, J. (1992). Interdiscilinaridad y categorías culturales en la arqueoastronomía de Mesoamérica. Cuadernos de Arquitectura Mesoamericana 19, 23-44. Carlson, J. B. (1991). Venus-regulated Warfare and Ritual Sacrifice in Mesoamerica: Teotihuacan and the Cacaxtla “Star Wars” Connection. Center for Archaeoastronomy, College ark. Carlson, J. B. (1999). Pilgrimage and the equinox “serpent of light and shadow” Phenomenon at the Castillo, Chichén Itzá, Yucatán. Archaeoastronomy: The Journal of Astronomy in Culture, 14 (1): 136-152. Cases, J. I., Belmonte, J. A., Lacadena, A. (2004). Análisis de uniformidad de las Series Lunares mayas del eriodo Clásico: rimeros resultados. In: Boccas, M., Broda, J., ereira, G. (Eds. ), Etno y arqueoastronomía en las Américas, Memorias del Simosio ARQ-13 del 51 Congreso Internacional de Americanistas, Santiago de Chile, . 195-210. Caso, A. (1967). Los calendarios prehisánicos. Universidad Nacional Autónoma de México, México. Closs, M. . (1994). A glyph for Venus as evening star. In: Fields, V. M. (Ed. ), Seventh Palenque Round Table, The Pre-Columbian Art Research Institute, San Francisco, . 229-236. Closs, M. ., Aveni, A. F., Crowley, B. (1984). The Planet Venus and Temple 22 at Coan. Indiana 9, 221-247. Fox, J. A., Justeson, J. S. (1978). A Mayan Planetary observation. Contributions of the University of California Archaeological Research Facility 36, 55-59. Fuls, A. (2007). The calculation of the Lunar Series on Classic Maya monuments. Ancient Mesoamerica, 18 (2), 273-282. Galindo Trejo, J. (1994). Arqueoastronomía en la América antigua. CONACYT – Ed. Equio Sirius, México. Iwaniszewski, S. (1989). Exloring some anthropological theoretical foundations for archaeoastronomy. In: Aveni, A. F. (Ed. ), World Archaeoastronomy, Cambridge University Press, Cambridge, . 27- 37. Iwaniszewski, S. (1994). De la astroarqueología a la astronomía cultural. Trabajos rehist. 51 (2), 5-20. Justeson, J. S. (1989). Ancient Maya ethnoastronomy: an overview of hieroglyphic sources. In: Aveni, A. F. (Ed. ), World Archaeoastronomy, Cambridge University Press, Cambridge, . 76-129. Kelley, D. H. (1976). Deciphering the Maya Script. University of Texas Press, Austin. Knowlton, T. (2003). Seasonal implications of Maya Eclipse and rain iconography in the Dresden Codex. J. Hist. Astron. 34, 291-303. Köhler, U. (1991). Conocimientos astronómicos de indígenas contemoráneos y su contribución ara identificar constelaciones aztecas. In: Broda, J., Iwaniszewski, S., Mauomé, L. (Eds. ), Arqueoastronomía y etnoastronomía en Mesoamérica, Universidad Nacional Autónoma de México, México, . 249-265. Lóez Austin, A. (1973). Hombre-dios: Religión y olítica en el mundo náhuatl. Universidad Nacional Autónoma de México, México. Lounsbury, F. G. (1978). 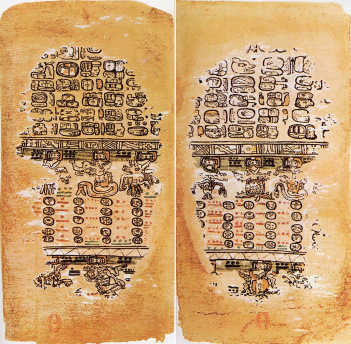 Maya numeration, computation, and calendrical astronomy. In: Gillisie, C. (Ed. ), Dictionary of Scientific Biography, v. 15, sul. I, Charles Scribner’s Sons, New York, . 759-818. Lounsbury, F. G. (1983). The base of the Venus Table of the Dresden Codex, and its significance for the calendar-correlation problem. In: Aveni, A. F., Brotherston, G. (Eds. ), Calendars in Mesoamerica and Peru: Native American Computations of Time, BAR International Series 174, Oxford, . 1-26. Lounsbury, F. G. (1989). A Palenque king and the Planet Juiter. In: Aveni, A. F. (Ed. ), World Archaeoastronomy, Cambridge University Press, Cambridge, . 246-259. Love, B. (1994). The Paris Codex: Handbook for a Maya Priest. University of Texas Press, Austin. Love, B. (1995). A Dresden Codex Mars Table? Lat. Am. Antiq. 6, 350-361. Luo, A. (1991). La etnoastronomía de los huaves de San Mateo del Mar, Oaxaca. In: Broda, J., Iwaniszewski, S., Mauomé, L. (Eds. ), Arqueoastronomía y etnoastronomía en Mesoamérica, Universidad Nacional Autónoma de México, México, . 219-234. Malmström, V. H. (1997). Cycles of the Sun, Mysteries of the Moon: The Calendar in Mesoamerican Civilization. University of Texas Press, Austin. Martin, F. (1993). A “Dresden Codex” eclipse sequence: projections for the years 1970-1992. Lat. Am. Antiq. 4, 74-93. Milbrath, S. (1999). Star gods of the Maya. University of Texas Press, Austin. Reyman, J. E. (1975). The nature and nurture of archaeoastronomical studies. In: Aveni, A. F. (Ed. ), Archaeoastronomy in Pre-Columbian America, University of Texas Press, Austin, . 205-215. Ruggles, C. (1999). Astronomy in Prehistoric Britain and Ireland. Yale University Press, New Haven – London. Šrajc, I. (1993a). The Venus-rain-maize complex in the Mesoamerican world view: art I. J. Hist. Astron. 24, 17-70. Šrajc, I. (1993b). The Venus-rain-maize complex in the Mesoamerican world view: art II. Archaeoastronomy 18 (sul. to J. Hist. Astron. 24), S27-S53. Šrajc, I. (1995). El Satunsat de Oxkintok y la Estructura 1-sub de Dzibilchaltún: unos auntes arqueoastronómicos. In: Memorias del Segundo Congreso Internacional de Mayistas, Universidad Nacional Autónoma de México, México, . 585-600. Šrajc, I. (1996). La estrella de Quetzalcóatl: El laneta Venus en Mesoamérica. Ed. Diana, México. Šrajc, I. (2001a). La astronomía. In: Manzanilla, L., Lóez Luján, L. (Eds. ), Historia antigua de México, vol. 4, Instituto Nacional de Antroología e Historia – Universidad Nacional Autónoma de México – M. A. orrúa, México, . 273-313. Šrajc, I. (2001b). Orientaciones astronómicas en la arquitectura rehisánica del centro de México. Instituto Nacional de Antroología e Historia, México. Šrajc, I. (2005). More on Mesoamerican cosmology and city plans. Lat. Am. Antiq. 16, 209-216. Šrajc, I. (2008). Alineamientos astronómicos en la arquitectura. In: Šrajc, I. (Ed. ), Reconocimiento arqueológico en el sureste del estado de Cameche, México: 1996-2005, BAR International Series 1742, Archaeoress, Oxford, . 233-242. Šrajc, I. (2009). propiedades astronómicas de la arquitectura rehisánica en la isla de Cozumel, Quintana Roo, México. In: XIX Encuentro: Los Investigadores de la Cultura Maya, Universidad Autónoma de Cameche, Cameche (in press). Šrajc, I., Morales-Aguilar, C., Hansen, R. D. (2009). Early Maya astronomy and urban planning at El Mirador, eten, Guatemala. Anthropological Notebooks 15 (3), 79−101. Tedlock, B. (1992). The road of light: theory and Practice of Mayan skywatching. In: Aveni, A. F. (Ed. ), The Sky in Mayan Literature, Oxford University Press, New York – Oxford, . 18-42. Thomson, J. E. S. (1939). The Moon goddess in Middle America: with notes on related deities. Contributions to American Anthropology and History 29, Carnegie Institution of Washington ubl. 509, Washington. Thomson, J. E. S. (1950). Maya Hieroglyphic Writing: An Introduction. Carnegie Institution of Washington Publ. 589, Washington. Thomson, J. E. S. (1972). A Commentary on the Dresden Codex: A Maya Hieroglyphic Book. Memoirs of the American Philosophical Society 93, Philadelphia. Tichy, F. (1991). Die geordnete Welt indianischer Völker: Ein Beisiel von Raumordnung und Zeitordnung im vorkolumbischen Mexiko. F. Steiner, Stuttgart. Waerden, B. L. van der (1974). Science Awakening II: The Birth of Astronomy. Noordhoff International – Oxford University Press, Leyden – New York. From Ancient Astronomy: India, Egypt, China, Maya, Inca, Aztec, Greece, Rome Genesis, Hebrews, Christians, the Neolithic and Paleolithic (Cosmology Science Publishers, 10.20.2015) published by Erenow, public open access. This entry was posted in Uncategorized and tagged Ancient, Astronomy, History, Mesoamerica, Science. Bookmark the permalink.